Shireen and Arni Thor's hair tie bracelet keeps easy-to-lose hair ties secure and beautiful on your wrist. Wearing a hair tie on your wrist is one of fashion's great faux pas. But with runaway barrettes on the loose, it's the most convenient method to keep your mane managed on the go. Shireen and Arni Thor's hair tie bracelet provides an elegant solution. After noticing his wife Shireen's constant search for hair ties and the pain she experienced while snapping them on her wrist, Arni, a design engineer, presented a prototype of this bracelet to her as a gift. Together, they refined the design to create this clever piece that keeps those easy-to-lose accessories on lock and comfortably on hand. 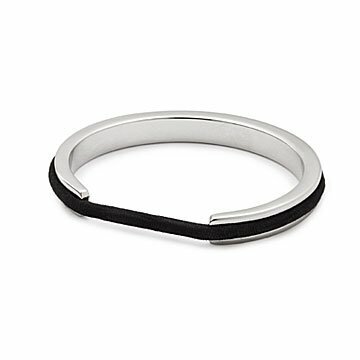 Their sleek slip-on bracelet has a channel that holds thick or thin bands in place, alleviating the pressure from the elastic around the wrist while giving the everyday hair tie a bold makeover. Made in China. As is the case for long-haired people around the world, Shireen Thor struggled with two things when it came to keeping hair out of the way: keeping track of where her hair ties were, and managing the discomfort—not to mention the unsightly look—of indentations on her wrists. This bracelet started as a present created by her husband, design engineer Arni Thor. "The ever-observant engineer that he is noticed my habit (a basic necessity!) of wearing an elastic band around my wrist," she said. The idea was so unique, they currently have multiple worldwide patents and others pending! It is beautifully crafted and has a good weight to it. Came in a lovely gift box with ribbon tie. My friend FLIPPED OUT when she received this bracelet. She used words like "genius", "perfect", "so creative" and "I should have invented this". I think that says it all! I will be sure to get one for myself!!!! My Daughter ALWAYS has a hair tie on her wrist to pull her waist length hair back. The hair ties look so silly and they leave an imprint on her skin. NOW with this bracelet the hair tie looks more grown up and stylish, and no longer leaves that ugly dent on her wrist! Very unique gift. Classy and practical. I love this product. I use it just about every day. I gave this bracelet to four girls, ages 21-34. They all loved it immediately upon seeing it. They all put it on! I knew this would be a perfect gift, given they all have long hair - and often have it up. They could not have been more thrilled. One of them had actually seen it before and was so happy to have one! This was a major hit, and I couldn't be happier to have found it! Great idea, but not thought out. She couldn't even come close to getting this bracelet on. There was no flex in it and it was tiny. Ridiculous.